Our loving Mother, Sally Fay Alma, died peacefully on Saturday, April 19, 2014, in the presence of her two daughters and sons-in-law. Mom and Dad had lived together at their family home in Bellevue, since 1990, until he passed away on Aug. 21, 2010. Mom continued to live at home, but her failing health recently necessitated that she move to Hailey, where she spent the last month of her life, under the attentive care of the nurses and staff at the Bell Mountain Manor. Mom was born Sept. 25, 1915, in Tabowie (now Unsan), near Pyong Yang, in what is now North Korea. She was the youngest of five children, a sister and three brothers, born to Adelrick and Elizabeth Benziger. A sixth child, her sister Ruth, died as an infant. In 1912, the Benziger family had traveled from New York to Vienna, to Moscow, and then to Tabowie, via the luxurious Trans-Siberian Railroad. Adelrick had taken an engineering position there with Oriental Consolidated Gold Mining Co., financed by Elizabeth’s uncle Henry Perkins. In September 1919, after Ruth’s death, Elizabeth and the children left Korea, via Yokohama, Japan, to Vancouver, B.C., a three-week journey. They then boarded the Canadian Pacific Railroad, traveling through the Rockies, and eventually back to their family home on Staten Island, N.Y. Adelrick followed later that year, returning to New York in 1920, after traveling from San Francisco, through the American West. Life in the East was short lived, and his experiences in the West beckoned, as Adelrick and Elizabeth sought the adventure of oil exploration in Oklahoma. Quality faith-based education was not common in the American West at that time, so Sally and her siblings were all sent to Jesuit or Sacred Heart boarding schools in Europe or in the East. Later, the talk of a wheat and farming boom in Nebraska and Colorado led the family farther west to a ranching life, where Sally fell in love with the wide-open spaces and all creatures great and small, especially her beloved horses. Despite the stock market crash of 1929, the Benzigers were able to purchase the Diamond Tail Ranch near Laramie, Wyo., and moved there in 1931. At the height of the Great Depression, the family hosted dudes aside from operating a full-scale cattle ranch. In 1941, one of the dudes who had visited the CM Ranch in Dubois, Wyo., also visited the Diamond Tail. The name of this tall, handsome dude was H. Willem Alma. Sally was smitten, and the two of them fell madly in love. They married five months later, in New York. Their married life took them next to San Francisco, and eventually to Seattle in 1948. In 1949, Wim and Sally made their home in Beaux Arts Village, near Bellevue, Wash., where Sally took the reins of motherhood and homemaker to their three young children. While Dad served as Honorary Consul of the Netherlands, Mom was equally at home, either entertaining Prince Bernard, speaking in fluent Dutch and French, as she was herding cattle, digging her own vegetable garden, acting as a Cub Scout den mother, or heading guilds at Sacred Heart Catholic Church in Bellevue. 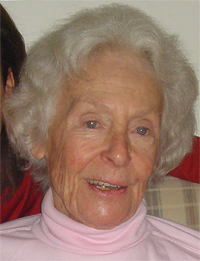 Sally is survived by her children, Mischa (Howard) Leendertsen of Ketchum, Idaho, Willem (Shari) Alma of Kirkland, Wash., and Mary (John) Mills, of Bellevue, Idaho; grandchildren Elizabeth (Jim) Giedraitis, Christine (Greg) Parks, Annelise (Brett) Franklin and Christopher Alma; and five great-grandchildren. The family wishes to express gratitude to all the dear and wonderful caregivers who helped make Sally’s life comfortable and content, during the last years of her life. A funeral Mass was held April 29 at Our Lady of the Snows Catholic Church. A celebration of Mom’s and Dad’s lives will be held at a later date. Remembrances can be made to Hospice and Palliative Care of the Wood River Valley, P.O. Box 4320, Ketchum, ID 83340, or a charity of your choice. Services are under the care of Wood River Chapel. Friends are invited to share memories, condolences, photos and light a candle at www.woodriverchapel.com.